The debate about net neutrality has been raging for years now, but it has never been more important than today. Here's how this fight affects the IT world. Just like a newborn baby, when the internet made its public debut, no one could have predicted just how powerful it would grow to be. Here we are in 2017 and that little baby has grown to become the most robust and prominent form of information sharing there is. Whether you log on to watch videos, search for news on current events or to find tools to manage your business, it's the go-to place to find knowledge and entertainment. Net neutrality is what allows for this open access and information free flow. But with the recent push by the Federal Communications Commission (FCC) to repeal net neutrality, this openness could be curbed. Net neutrality is essentially a battle between service providers and content providers. In one corner, Internet Service Providers (ISPs) like Comcast, AT&T, and Verizon want the FCC to roll back rules that dictate how they operate. On the other end, content providers like Google and Amazon are worried freedom of information will be stifled. In the middle is the public, users of the internet. 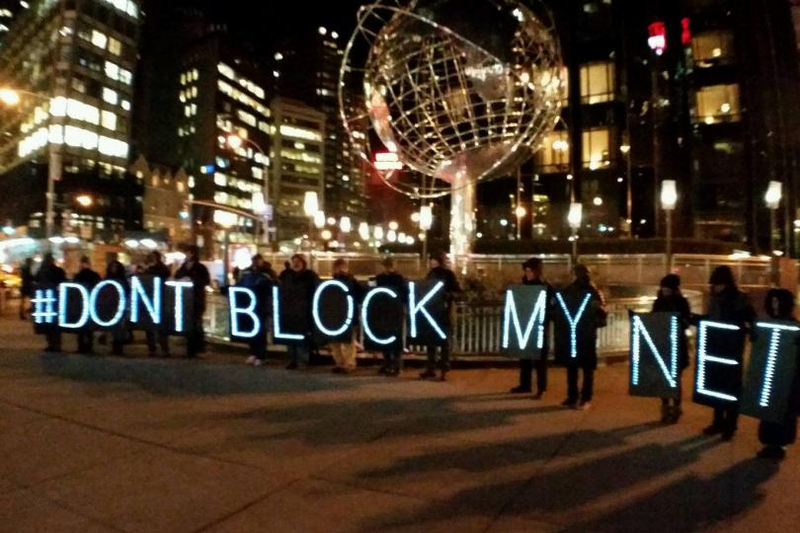 What does net neutrality mean for us? Will it reduce access to information? Will it change the way we use the internet? Let's take a closer look at what's at stake for the general public. What's Net Neutrality All about? Referred to as the first amendment of the internet, net neutrality is the idea that no matter what type of content you choose to access online, it's delivered quickly and without bias. Meaning, if you're searching for a list of the best restaurants in your neighborhood, all possibilities pop up in the search engine, and not just the ones the service provider wants to promote. With the current regulations in place, ISPs don't dictate what types of content they offer users. This rule goes back to 2010 when the FCC created The Communication Act Title I. It didn't come with a lot of restrictions, but ISPs pushed back anyway. They didn't want to be told how to operate and felt that the FCC didn't have the authority to enforce the rules. Meaning, an ISP like Comcast didn't feel the FCC had the right to regulate its network principles. For example, if Comcast wanted to decide network speed for the internet packages it offers users, it didn't feel the FCC had the right to tell them whether they could do that or not. The push back from ISPs meant that the FCC had to find better ways to regulate online competition. It responded by reclassifying ISPs under the Communication Act Title II in 2015. The idea was to avoid any anti-competitive advantage one ISP might have over another. Meaning, instead of slowing down content created by competitors, ISPs can't discriminate, they have to treat all content equally. This was seen as a bold move for the FCC since the new act includes stricter rules for how an open access internet should be governed. But alas, ISPs like AT&T and Verizon felt the new rules were too harsh and would slow innovation and investments into infrastructure. For example, ISPs feel innovation will slow down because they can't come up with new products or services fast enough to meet the changing needs of their users. They were concerned that FCC regulations would dictate what kinds of plans or services they could offer customers and what bureaucratic processes they'd have to follow-through on for new plans and services. For infrastructure investments, some ISPs think that the current regulations make it hard for smaller ISPs to get financing to invest in boosting their network capacity. While there isn't any proof to back these claims, the current FCC chairman, Ajit Pai, wants to repeal it. The reason? He believes that Title II isn't needed for stricter regulation and ISPs can govern themselves. To be fair, this discussion isn't just about keeping ISPs unbiased. Content providers, like search engines, have been showing paid ads at the top of SERPs for a long time. In a way, this is the kind of thing net neutrality tries to avoid, someone controlling what users see online. Both sides of this battle need some kind of regulation that results in fair play. The reality is that without net neutrality, Pai's proposal leaves the public at the mercy of ISPs to control website speed, access and cost to view certain websites. In the end, the internet fails to be open and doesn't resemble the place it's meant to be. This summer, we saw large companies participate in the Day of Action protest. Tech giants, like Google, Facebook, Amazon and Vimeo, tech startups and activists took to the digital streets to protest the dissolution of net neutrality regulation. What the internet might look like if preferential treatment is given to some content over others. If users have to pay to access content. If retail companies resort to using tactics that influence what ISPs display. These sorts of pop-ups did a good job of clearly stating what the future of the internet could look like: slow speeds, censorship, and extra fees. Tech companies and activists are passionate about this potential change to regulation because these impositions hurt their livelihood and their relationships with their users. Look at China where content that President Xi Jinping and his government don't agree with is censored and monitored very closely. ISPs have the authority to block access to any websites not approved or that contain banned keywords. Even though tech companies have huge stakes in the game, they don't have the same influence over the FCC as the public does, so the public taking action is key. For example, Canada “has emerged as a world leader in supporting net neutrality.” They got there by putting the needs of internet users first and not allowing ISPs to dictate access. This is not just saying yes or no to net neutrality, it's about having an authentic discussion about what's at stake. Look at it this way: 76% of Americans are in support of net neutrality. With more than three quarters in favor of it, the general public has an opportunity to go one step further and do something about it. There has already been a lot of engagement by the pubic online, but people can email Congress or phone their representative to talk about what these changes mean for them. There has already been over 5 million emails sent to Congress and over 124,000 phone calls made to representatives. The Day of Action protest was a way to educate the general public, but the conversation is still ongoing. It's important to voice opinions so that the internet remains fair and open to everyone. We're living in a digital age that encourages creativity and innovation. Every day a new app, product or process is released. A diverse range of small businesses thrive. People who use the internet enjoy the freedom it offers to explore and dream. An internet without net neutrality stifles the potential for growth if creativity and innovation are cut off. It's possible that increased latency will have an adverse effect on people who want to start a business. Currently, new businesses have access to low-cost options, like social media, to reach lots of people. This exposure is what eventually leads to their success. Let's say there are two new startups competing for the same target audience. One is completely independent while the other is backed by a major tech enterprise that has ties to an ISP. Without net neutrality, when a potential customer searches for content related to both start-ups, an ISP can boost the startup it has ties to over the other one by increasing latency. As a result, users don't see what's most relevant to them. Or let's say a potential customer wants to search for a specific company or product. Slow speeds or an additional cost to access the content could lead to frustrated users who can't easily access the products they need. This has the potential to hurt SaaS based businesses if customers start to believe that latency is unpredictable. For example, one day a site loads quickly and easily and on another day it takes longer or doesn't load at all. Something else to consider with latency is the move from monolith architecture to microservice architecture. The monolith approach was attractive because it meant fast builds that got MVPs up and running quickly, especially for start-ups. But as apps grow in size and complexity, so do coding and architecture requirements. Growth slows down as a result. Microservice architecture has become a better option because it breaks down apps into individual services which helps developers build out each one separately over time vs. the who app at once. So as apps grow and receive more calls, the flow works better. Without net neutrality, start-ups, in particular, are affected because the bigger they get, the more vulnerable they are to slow latency. Slow latency creates bottlenecks which limit innovation, because different services work together, if one slows down, everything else slows down. Startups already have limited access to the quality of service enterprises enjoy, taking away net neutrality only adds to the disadvantages they face. If fewer people aren't getting their needs met in the digital space, the potential for innovation drops and we find ourselves back in the early 1990s when barriers to entry were high. Without the tech innovations we enjoy today like various cloud technologies and mobile computing options, it would be harder for companies to set up shop. Today, a new business can build a website in a day because of innovation. This is what we need for businesses to run more efficiently. The public is left with fewer options and products available to them. Companies aren't able to organically grow their success online. The internet is no longer seen as the World Wide Web but a more limited version. That's why it's so important to speak out and explain how net neutrality helps and what the general public stands to lose. You've probably heard, “Speak now or forever hold your peace,” right? Well, it's true. Without voicing an opinion, anyone using the internet will have to accept the results, whatever they are. On July 12, 10 million people saw the protest ads. 2 million of these people then went on to submit comments to the FCC. But with tech users in the billions, this is just the beginning. There's still time to have your comments heard before the FCC makes as decision later this year. Before they make a decision, they'll respond to all comments on Aug 30. 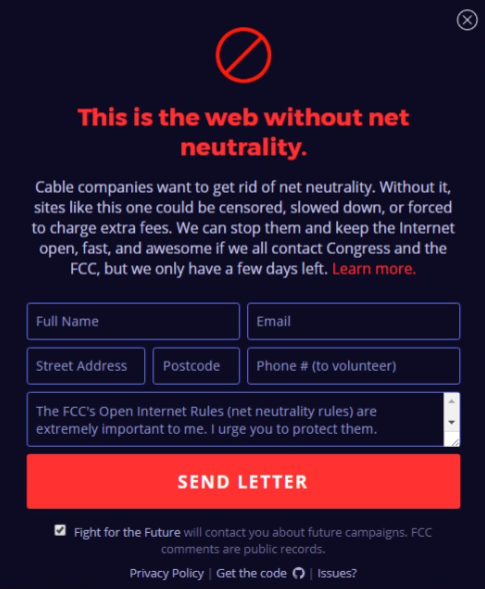 Send thoughtful, well-reasoned comments to the FCC to advocate for what matters to you. There's a lot of information out there about the impact of getting rid of net neutrality but don't just copy and paste what you see online. Give some thought to the impact the rollback will have on you and explain that in detail. The hope is that comments from the public will be enough to make the FCC take a step back and reconsider their proposal. For the internet to continue being a neutral, powerful source of information, its contents and distribution need to remain unbiased and free from third-party interests. 'Neutrality' means giving innovation, creativity, and information-exchange a fair shot. What kind of internet do you want? The power is in your hands.